BBC NEWS | UK | Scotland | How will the G8 impact Scotland? How will the G8 impact Scotland? 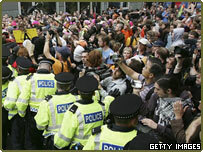 G8 protests have brought unprecedented scenes to the streets of Edinburgh. Saturday saw more than 220,000 people join the peaceful Make Poverty History march around the capital. But on Monday the centre of the city was brought to a standstill as police and protesters faced off following a demonstration called for by anarchist groups. First Minister Jack McConnell has claimed that potential benefits to Scotland of more than £500m justify the likely costs. We asked for your views on the disruption and whether hosting the G8 would increase Scotland's standing. I thought the police in Edinburgh today were absolutely fantastic. When faced with abusive, violent thugs they kept their cool and did what was right. I live and work in Edinburgh - this afternoon I watched these morons bring the city centre to a standstill - this isn't about the G8, this is about attention seeking layabouts who will fight under whatever banner suits them at the time. Well done to the police over the last few days. They took a very calm and measured approach and seem to have contained things so far, keeping violence (if not disruption) to a minimum today. Saturday was a joy. Hopefully, this approach will play a part in allowing us all to look back at the week as a whole positively, where the people did manage to get a message across to world leaders. Something like G8 could improve the quality of our own political debate and ideas and also spur more of us to try to do something about the continuing inequalities in our own society as well as elsewhere. I wonder how many children will have had their views formed by the discussions over the last few weeks - and will grow up to help improve our world. I think we must now live in a very sheltered environment if we think a few folk in black t-shirts chucking litter bins around makes for a serious civil disturbance! Some of these reactions seem rather OTT to me, but then I did have the option to work from home today! To say the anarchists haven't installed pliable dictators or dropped bombs is just small minded and stupid. These people are just here to cause trouble and have given the peaceful protestors from Saturday a bad name as this is all being done under the broad anti-G8 banner. Edinburgh is like a police state just now thanks to these people. Constant noise from helicopters and complete disruption to ordinary people who have to earn a living. I have zero sympathy for these people and can only commend the police for the calm manner they have shown in the face of outrageous provocation. I can't believe that a few hundred people can cause so much disruption to Edinburgh and show no respect. I saw protesters attacking the police (and a police horse!). They should be ashamed of themselves, but then they must be as they can't even show their faces. GO HOME ! A bunch of left wing thugs should be given no quarter. As far as I am aware, the anarchists haven't dropped bombs on anyone. They haven't installed any pliable dictators. They haven't destroyed entire towns. They haven't smashed up hospitals and schools. The real men of violence are those meeting at Gleneagles. The only reason these leaders meet is to further the cause of capitalist exploitation. Their motivation is fuelled by greed. They are the cause of poverty, war and suffering not the solution. They must be opposed as forcefully as possible. Are the rioters showing how strongly they care for the cause? Or is it a good excuse to fight, intimidate and destroy a peaceful city? We are trying to get the G8 to fix our problems about poverty and they are trying to shut down the G8. How is shutting down the G8 going to help? It's not! Stop wasting your time. These "protesters" are idiots. We do not want you in Edinburgh destroying our beautiful, peaceful city. Idiots, fascists and clueless morons!!!!! I think that these anarchists are not thinking realistically. We don't need people like that to ruin one of the best things that could ever happen. I also think that people have lost sight of the fact that G8 is actually a good thing, if we didn't have it, the same people would be up in arms at the fact world leaders don't get together to discuss important global matters. And a big thanks to all the idiots too scared to show their faces who decided to rip up Princes St Gardens today, what did that prove? I'm all in favour of protest, but if you're just here to jump on the band wagon and smash my beautiful city, GO HOME!! Cowards! Take off the black clothing and show us your faces. If you want to stop poverty and hunger in Africa, go and tell the current regime in Zimbabwe - face to face. These "people" cannot be allowed to ruin all the work that has been done to highlight this issue by peaceful protest. These people do not help any cause by their behaviour and I hope the police continue to crack down upon them. Football fans would never get away with causing widespread disruption, damage and intimidation in a city like this! So why are the police being so soft? The police have acted entirely correctly. I was on Princes Street for most of the afternoon and the demonstrators were provoking the police throughout the day. They threw stones, wooden benches, large bins and continually taunted the police. The atmosphere was tense this morning and it was clear that something was brewing. Well, the anarchists have got their headlines. Hopefully they'll now leave us alone and Edinburgh can get back to work - which is more than these activists seem to do! I just wanted to say a big thank you to all the police for their efforts to protect our city and its people from these terrorists. Yes, terrorists: people covering their faces with masks and scarves and causing unnecessary violence. What we saw on Saturday was a demonstration. It was peaceful and it was effective. What we are seeing on Monday is a bunch of thugs without a cause using the G8 as an excuse to attack the police and vandalise the city. I hope they are arrested and made to pay back every penny it costs to repair their damage and clear up their mess and every penny it cost to police them. Expected a bit of trouble when leaving the office a little earlier than usual for the train ride home. However, our police appear to be prepared, disciplined and measured in dealing with the disturbances, meaning the walk across town was safe. Looks like our police are already projecting a good image of Scotland around the globe. Wouldn't it be easier and a bit less costly if the world leaders of the G8 organised this meeting via the phone. If I remember correctly it is about 3p a minute to call America and Europe, they wouldn't even have to leave the comfort of their chairs. Just think of the money saved. How often does Edinburgh or even the UK host the G8? For ONE DAY in maybe 20 years we have to face some disruption to our work and travel. That's a small price to pay for living in a country where political dissent and protest are tolerated. AS a result of that toleration, it's almost inevitable that a few people will take the opportunity to protest in violent ways. Edinburgh is not a city in chaos. I have to have my say, to counter the exaggerated response that's bound to come tomorrow from hysterical tabloids and people who weren't even actually here. Take your lead from Lothian Police and the way they're handling this, be calm and leave off the hysterics. I really don't think that there was any need for this protest. In my view I thought that the Live 8 concert was the best way to make the politicians aware of what these people wanted. I feel that this protest is only an excuse for violence. And who is going to take responsibility for all the damage done to Edinburgh? Bob Geldof? I highly doubt it. I used to work in Edinburgh and am very glad to be retired now! The Festival was disruptive enough! These troublemakers should be arrested and made to pay for the overtime being worked by the police. I am very much afraid we are in a dangerous situation which is far from over. These people are dangerous. I have witnessed a citizen's arrest of a thug who threw a brick at a window. Credit to the police for keeping a lid on it and credit to those who have marched peacefully over the past few days, but I find it embarrassing that some of the posts from Edinburgh have condoned this destructive and distracting criminality. Companies and their workers pay taxes to the governments...how else could our governments afford to cancel world debt? Anyone who wants to wreck property and be violent should be sent off to Africa for six months to do voluntary work that might just make a difference! A peaceful protest by sensible caring people will be heard...a protest by hooligans will give the wrong message I'm sure. This is supposed to be a time where the people rise up to G8 leaders in a peaceful way. Violence would make everyone's efforts futile. Scotland is on the tip of everyone's tongue at the moment because of this meeting, which can only be good. I feel positive about Scotland and I think it is growing stronger every year and this kind of thing happening is really good for the country. Although I agree with the reason behind the protests I do not agree with the protests. I have spent much of the day in my office scared. Information has been slow to filter through and not knowing what was happening was horrible. The people behind these riots need to look at the people that are indirectly involved. Unfortunately it is a work day that will take a long time to forget. It's OK having these protests and asking people to give up work and join in, but who will pay our bills when we get sacked? Anyone with half a brain must have known that offering to host the G8 would end in disaster, but the chance to have their egos massaged must have been too much of a temptation for Blair and McConnell. Get a job and a life and pay some tax - that way you might do some good for the people you seem to want to help. Have people forgotten that the G8 is actually a good thing. Why protest against it? We should be protesting for it. At least these leaders are meeting. Would we rather they didn't? I think it's great that the public have the right to protest and make our voice heard. Those folks that want to incite a riot or damage property though - GO HOME! You're not welcome. If the people protesting in the city centre of Edinburgh are peaceful then why are they covering their faces with scarves and masks? These thugs are causing trouble for the sake of it and are ruining it for the peaceful protestors who are there. I would dare to put these 'anarchists' in the same bracket as football hooligans. Lets make poverty history - humbug. This day cost me overtime that was badly need for my family, I wont get a handout to get reimbursed. And what about the homeless in our own country? Let's get it right here first before preaching to others. Protestors dressed as clowns tickling the riot shield (and possibly the posterior) of a policeman (who seemed to be giggling) was the extent of the anarchy I saw on my lunchtime stroll across Edinburgh. Thanks, clowns, for that image...and in the light of the issues highlighted by the 'Make Poverty History' march I'm not really concerned about the short-term disruption either to the interests of a few large and very rich corporations or to my bus home (I'll walk and enjoy the sunshine). The G8 would be of greater benefit to Scotland if its organisers had taken its location, and the implications of that, into greater account. Holding the G8 so near to the capital is an open invitation for much higher security risks and costs. I hope Edinburgh will be remembered forever as the place where the G8 governments listened to the voice of the people and agreed to increase aid, cancel debts and make trade fair. The activities of the extreme protesters today will quickly be forgotten, but the image of over 200,000 people forming a white band around the city and standing in silence - that will endure for a long time and perhaps will Make Poverty History. Credit has to go to the 250,000 people that did Scotland, the UK and democracy proud on Saturday, as they peacefully, though a wee bit naively, marched through Scotland's capital. Their voices I'm sure were heard loud and clear (even if they are not acted upon). However this is in severe danger of being forgotten about now thanks to today's 'developments'. A demented few hundred people are running riot in what is warmly referred to as the Athens of the north, terrorising its residents and causing as much damage as possible to the beautiful city centre. We can only hope that the police are as heavy handed as possible and they better hope that they don't cross my path on my way home from work. SCUM, THE LOT OF THEM. A charitable definition of anarchy is that it is the opposite of hierarchy. But if we are to solve political and economic problems in the world, such as poverty in certain African countries, how are we to do it with nothing but 'grassroots consensus'? Surely anarchy, even by this definition, would afford despotic elements limitless potential. With no hierarchy, what would stop them? Who would be marshalling the forces preventing their onward march? Glaring problems such as this lead me to believe that the people currently 'demonstrating' on the beautiful streets of Edinburgh are simply attempting to disrupt with no likely political benefit to anyone. As such the only plus is that the police have had an opportunity for a demonstration of their own; showing their effectiveness and professionalism in preventing the march of extremism in our own part of the world. I would love to know how the G8 is going to bring any money into Scotland, never mind £500m. I can tell you for a fact that it has cost my business around £2,000 in lost sales. It's not like the country is even going to get good marketing from this. Why cant they do it in a nuclear bunker under the dessert? Jack McConnell should just shut up and do something useful for the nation like banning smoking! A few smashed windows on Princes Street have their place, when aimed strategically at the shops who make money from sweatshop labour. No bad thing, if it makes people ask themselves why those shops in particular were targeted. I feel ashamed that Scotland will play host to George Bush. The casualties in Iraq are a disgrace to humankind. And who will benefit from this £500m? Not me, who pays my council tax and now finds myself stuck at work. As usual it's the shops and leisure industry who benefit and the residents don't see a penny of it. Considering the whole week seems to be revolving around coming to terms with the level of poverty in the world, is it not ironic that Jack McConnell is using the summit to highlight the financial benefits to Scotland. Surely he should be talking about the financial benefits for third world countries, and not only in Africa. On another note, the uprising in the city this afternoon will achieve nothing and is nothing more than a hot-bed for individuals with their own agendas using the G8 as an excuse to vent their own anger...idiots. If this minority of protesters have violence in mind then it makes a bad example of all the protesters not just themselves. Keep Scotland Bonnie!!! After Saturday, when just as many people marched in Edinburgh to protest as gathered in Hyde Park to hear free music, it would be a slap in the face of democracy to ignore these people's voices. I have a great deal of sympathy for more vocal protestors, such as the ones in the centre of town today. If it were not for these people, Blair, Bush, et al would not take a blind bit of notice. I feel sorry for the people working over in Edinburgh today who are going to have to commute home. These protestors are causing havoc for the working person, at least the one on Saturday was organised and peaceful! These idiots are just causing chaos for the sake of causing chaos. But it must be said that the police have conducted themselves in a very professional manor at both these marches. There are always a few people who spoil it for everybody else. Already this week I have seen an inordinate amount of illiterate, hippy marker pen scrawling in this beautiful, historic city. The people of Edinburgh don't deserve to be treated with such disrespect by migrant trinket-trading frisbee throwing fruitcakes. Anybody who is willing to treat the city with the respect it deserves is welcome though. Our city is a peaceful and beautiful place and doesn't deserve to be invaded and damaged like this. Get out and don't come back until you've worked out what it is you're supposed to be protesting about!